Blue Jay, our renowned journal of conservation and nature, celebrates over sixty years of continuous publication. In Blue Jay you will read about backyard observations, careful and detailed observations of natural events, as well as the results of scientific research. Blue Jay also features poetry and artwork. 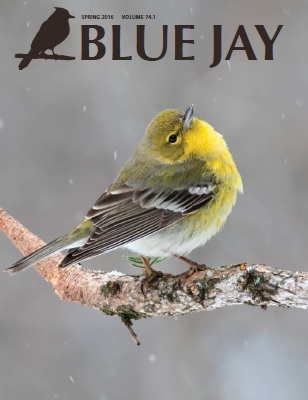 Blue Jay is a longstanding naturalist publication that allows both scientists and amateurs, to share their research findings and observations of the natural history of Saskatchewan and the Prairie Provinces. Published continuously by Nature Saskatchewan since 1942, Blue Jay has gained prestige with a national and international reputation and is distributed to university libraries and schools alike. Blue Jay will continue its long tradition of excellence in publishing the very best natural history articles. Members of Nature Saskatchewan receive the Blue Jay on a quarterly basis. If you are interested in subscribing to Blue Jay please visit our membership page to learn how to become a member of Nature Saskatchewan. Individual copies can be purchased from the Nature Saskatchewan office.